Letters found in the British Library suggest that Silbury Hill in Wiltshire may originally have been built around a 40ft "totem pole". The two letters, from 1776, were written by Edward Drax of Bath, who hired miners to dig a shaft in Europe's largest prehistoric man-made mound. They detailed the discovery of a "perpendicular cavity", measuring six inches wide and about 40ft deep. Experts said that could have been a totem pole or an oak tree. Fragments of timber, thought to be oak, were later found at the bottom of the shaft. Silbury Hill, part of the Avebury World Heritage site, is thought to have been completed in about 2400 BC. It was thought the hill was a burial mound but no grave has been found and its purpose is unknown. Drax, who hired a team of miners from the Mendips to dig a 125ft shaft from the top of the hill to the centre, wrote the letters to his friend Lord Rivers. The letters were tracked down by a local historian. 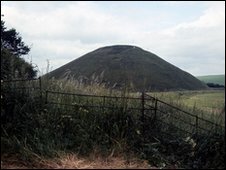 David Dawson, director of the Wiltshire Heritage Museum in Devizes, said it was thought that the hill started as one or more low mounds and built up from there. He added: "Everything is speculation - there was a void and the suggestion is it was a cast of a timber. "It could have been a totem pole or it could have been an oak tree."